The numbers, outlined in an October 2010 offer, estimate that Samsung would have owed Apple about $250 million for the year, much was less than what the iPhone maker was spending on components, reports All Things D.
In addition to the license fees, Apple offered a 20 percent discount if Samsung were to cross-license its own patent portfolio to Apple which would have brought royalties down to $24 and $32 for smartphones and tablets, respectively. 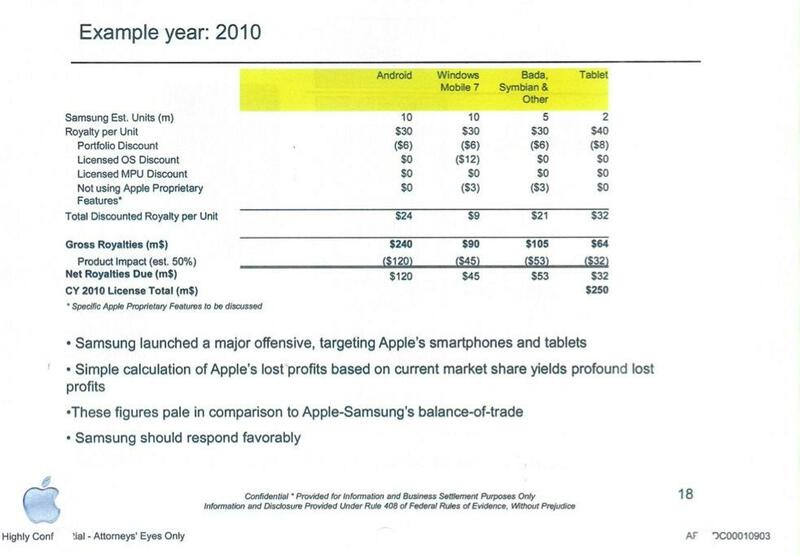 Non-Android royalties requested by Apple included $30 for smartphones running Windows Mobile 7 and another $30 for all other mobile operating systems like Bada. The discounted rate for these devices would have been more substantial as they didn't use Apple's "proprietary features." Negotiations were obviously ineffective, or non-existent, as the Apple v. Samsung trial is already well underway.